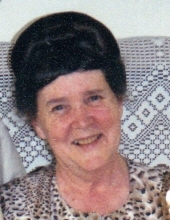 Carol Sue (Raines) McKemy, 83, of Kenna passed peacefully and went to be with her Lord on February 1, 2019 at Bowers Hospice, Beckley, following a long illness. Born on December 17, 1935, Carol was the daughter of the late Dallas and Ava Rhodes Raines. Besides her parents, she was preceded in death by sisters Lorain Stogdon and Gay Lucille, who died as an infant; brothers, Donald and Lee Raines. Carol was a homemaker and devoted her whole life to taking care of her family. She spent most of her life in her kitchen; everyone agreed she was the best cook ever. She enjoyed sewing, cooking, baking and decorating cakes. She loved when any of her family came home to see her and you could depend on her having your favorite foods fixed when you walked in the door. She cherished the time she got to spend with her children, grandchildren and great-grandchildren. She will be sorely missed by all of them. Survivors include her husband of almost 65 years, Ervil McKemy; daughters, Cindy Lilly and husband Eddie of Beaver, Debbie Cadle of Daniels, Becky Vest and husband Ronald of Ripley; sons, Tim McKemy and wife Sheryl of Leon , Jim McKemy and wife Reba of Kenna; 20 grandchildren and 13 great-grandchildren with 3 more expected that she would have loved to meet. Carol was a member of the Spoken Word Tabernacle in Beaver. A service to celebrate Carol's life will be held at 3:30 pm on Tuesday, February 5, 2019 at Waybright Funeral Home, Ripley with Rev. Roy Shrewsbury officiating. Burial will be in the Fairplain Cemetery. Friends may visit with the family from 1:00 pm until the time of the service at the funeral home. To plant a tree in memory of Carol Sue McKemy, please visit our Tribute Store. "Email Address" would like to share the life celebration of Carol Sue McKemy. Click on the "link" to go to share a favorite memory or leave a condolence message for the family.